You people probably receive many e-mails a year with people doing ancestry research...I am another. I have traced my roots back to North Gower and Osgoode Townships and would like to find more information if available. My grandfather was Edward LaPlante born 1900 to Basil LaPlante and Margaret Kelly. This data has been thoroughly checked and verified. 1) John LaPlont/Catherine Laplont (suspect census misspelling) and their 6 children - is this the same family? or different? I realize that this may be inconvenient, so if you can point me in the right direction, it would be much appreciated. If you wish I can call you at your convenience. We do have information re Kelly/LaPlante in Osgoode twp. Would love to hear from you re what you have found. 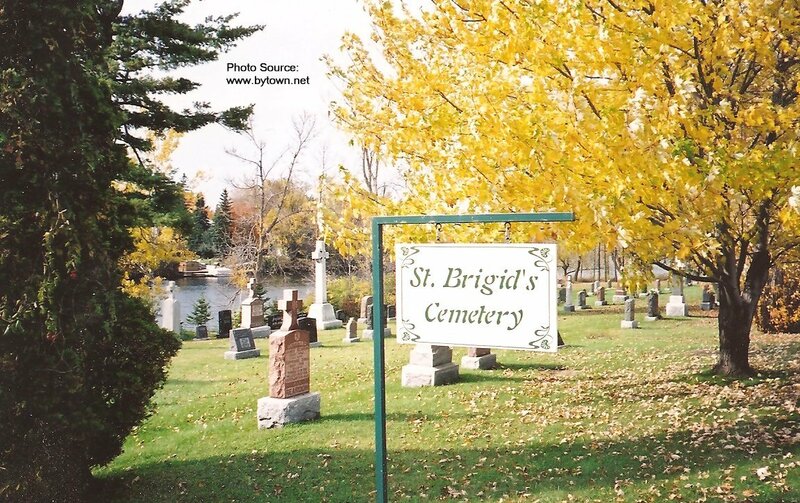 any of the local cemeteries;  I do not see it on their list http://ogsottawa.on.ca/publications/  but ask. They also hold all the filmed marriages and maps at their resource centre, and assessment rolls. 6) The North Gower Cheese Factory is fun to visit. Let me know how your trip works ... There is a lot of data - you just have to seek it. Ask people where the land records are. They have amazing detail. Here are Basile and Catherine in the 1881 Census for North Gower Township. lot of work on the family too. unrelated people are not uncommon. Hi: It's OK to add my email. I have an old photo of my grandmother, Bertha Laplante Arnold who died in 1928. I don't think I could scan it as it is plaqued. There is also Margaret Laplante MacFarlane, my great aunt. I may have a pic of her. The Laplantes lived in Billings Bridge where John was a builder. beloved wife of John  H McEwen died Sept.16 1913  age 28 years. Celia Laplant  1894-1973 .
land for St. John's Church). many farmers. thrashing their grain , etc. There is Basil ,No Tombstone Buried there. some time's , one ask oneself  a question , Could This Basil be ancester ?? There is a Baseal Leplent tombstone at Holy Cross Cemetery. Very faded and the dates are not readable. But this stone belongs to one of the pioneers in Kemptville. Here is a record which includes Basil Laplante. Source Drouin Records at ancestry.ca for Notre Dame Cathedral. There is a lot of information in the church records! at the village of Wellington (now Kars). 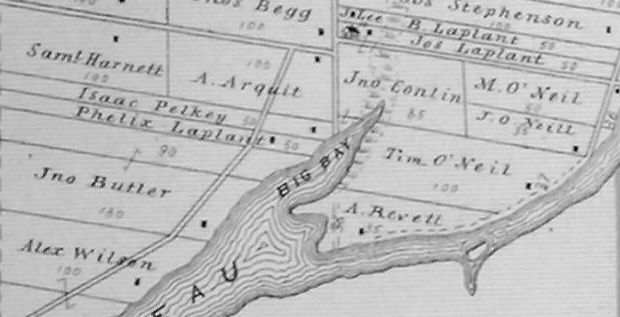 Another French Canadian farm owner2 on the map is Antoine Rivest / Rivet / Revett, who was a shoemaker.